Introduction: The prevalence of diabetes is increasing worldwide resulting in foot complications, which leads to poor quality of life and increased cost of living. Aim: The main aim of this study was to find out the foot complications in diabetic patients and to analyze the underlying etiology. Methodology: A retrospective study was carried out in the podiatry Department of Amrita Institute of Medical Sciences, Kerala among 277 diabetic patients with recent and recurrent foot complications. Results: Systemic hypertension (76.89%) has been found to be one of the major risk factor coexisting in the study population. 49.45% patients had preexisting peripheral neuropathy and non-healing ulcers were seen in 41.51%. Other complications include charcot arthropathy (10.46%), gangrene (9.38%), cellulitis (7.94%), fungal infections (6.89%), callus (3.61%), osteomyelitis (3.97%), and necrotizing fasciitis (2.52%). Culture report on foot ulcer patients revealed that Gram-positive Staphylococcus species (18.8%) and the Gram-negative Pseudomonas species (18.2%) were the predominant organisms. Other organisms isolated were Klebsiella species, Escherichia coli, Acenetobacter, Proteus, Enterococcus species, and streptococci. Fluoroquinolones were the most commonly prescribed antibiotics (33.5%), followed by penicillin (8.3%), clindamycin (6.1%), carbapenems (5.05%), cephalosporins (2.8%), cotrimoxazole (2.5%), and chloramphenicol (0.7%). Conclusion: The study highlights the importance of foot care, relevance of early detection of diabetes and subsequent monitoring of diabetic complications. The main aim of this study was to find out the foot complications in diabetes mellitus (DM) patients and to analyze the underlying etiology. A retrospective audit was carried out in the podiatry Department of a Tertiary Care Hospital in South India. Diabetic patients with recent and recurrent foot complications who visited the podiatry department during the period of January to December 2013 were included in this study. Ethical approval was obtained from institution Ethics Committee. Non-diabetic patients with foot complications were excluded from the study. Relevant data pertaining to demographic characteristics, duration of diabetes, details of foot complications, microbiological culture report, and management of complications etc., were obtained from the hospital information system. A total of 277 patients (including type 1 and 2 diabetes) with diabetic foot complications were analyzed; out of which, 200 (72.2%) were males and 77 (27.7%) were females. The age range was between 19 and 87 and the mean age was found to be 61 years. Almost 56% of study population had duration of diabetes <10 years and the mean duration was 8.5 ± 4 years. 76.89% had systemic hypertension, 11.9% had dyslipidemia, 3.97% had renal failure, 9.74% had chronic artery disease, and 0.72% of study population had liver disease as comorbid conditions. Peripheral neuropathy (49.45%) and non-healing ulcers (41.51%) were the common complications experienced in the study population. Other complications include charcot arthropathy, gangrene, cellulitis, fungal infections, callus, osteomyelitis, and necrotizing fasciitis. Peripheral vascular disease was present in 3.24% of study population. Details were provided in [Table 1]. 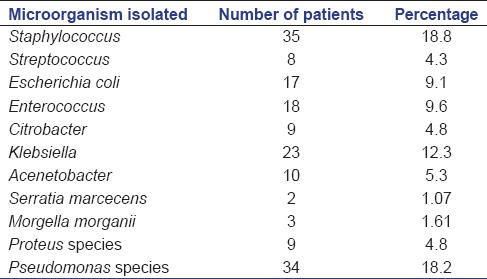 Microbiological study was carried out in 130 foot ulcer patients, of which 26 cultures showed no growth, 50 cultures were single isolates, and 54 cultures showed multiple isolates. A total of 186 organisms were isolated from tissue and bone culture of foot ulcer patients which include non-healing ulcer, gangrene, osteomyelitis, and necrotizing fasciitis. Gram-positive Staphylococcus species were the predominant organism which accounts for 18.8% of infection followed by the Gram-negative Pseudomonas species which constitute 18.2%. Other organisms isolated were Gram-negative Klebsiella species, Escherichia More Details coli, Acenetobacter, and Proteus as well as Gram-positive Enterococcus species and streptococci. Gram-negative Morganella morganni and Serratia marcecens constitute comparatively lesser population which was 1.61% and 1.07%, respectively. The microorganisms isolated were listed in [Table 2]. The antibiotics prescribed were also analyzed and found that fluoroquinolones were the most commonly given antibiotics (33.5%) followed by penicillin, clindamycin, carbapenems, cephalosporins, cotrimoxazole, and less commonly given was chloramphenicol which constitute only about 0.7%. The antifungal agent fluconazole was given to 3.6% of patients. The prescribed antibiotics were presented in [Table 3]. The foot complication was found to be more prevalent in type 2 DM patients that correlate with other similar findings. , The foot complications were more prevalent in the age group 60 and above, but it was reported to be more prevalent in the age group between 50 and 59. The aging process entails a gradual decrease in functional capacity and can lead to foot complications, mainly due to self-care difficulties. Systemic hypertension was one of the major risk factor co existing in the diabetic patients having the foot complication which was similar to previous finding. Systemic hypertension develops in people with type 2 DM at a rate twice than that of non-diabetics and the prevalence rate was 38% in Indians. The result showed that the overall prevalence of peripheral neuropathy was higher in the study population. It is known that the peripheral neuropathy and peripheral vascular disease are the potential risk factors for foot complications. Foot infections in diabetes were rarely due to single organism. , Aerobic bacteria (Staphylococcus spp., Streptococcus spp., and Enterobacteraciae), anaerobic flora (Bacteroides spp., Clostridium spp., and Peptostreptococci spp. ), and fungi were the organisms most often isolated. , In some studies, monomicrobial isolates were most common. , This kind of discrepancy could be because of geographical variations or the types and severity of infection included in the studies. ,, Of 130 foot ulcer cultures 26 cultures showed no growth, 50 cultures were single isolates, and 54 cultures were polymicrobial. Staphylococcus species (18.8%) and Pseudomonas species (18.2%) were the main causative organisms isolated, followed by Klebsiella species (12.3%), Enterococcus species (9.6%), E. coli (9.1%), Acenetobacter (5.3%), Proteus (4.8%), streptococci (4.3%), M. morganni (1.61%), and S. marcecens (1.07%). Number of studies have found that Staphylococcus aureus is the main causative pathogen ,, along with Pseudomonas aeruginosa, Proteus mirabilis, and bacteroides fragilis. ,, Gram-positive aerobic bacteria was found to be the predominant organisms causing diabetic foot infections in many studies , but recent investigations reported a predominance of Gram-negative aerobes. ,, Fluoroquinolones were the most commonly used empirical antibiotics in this study as it has broad spectrum of activity, relatively safe, and cost effective antibiotic compared to the other antibiotics. The present study gives an idea about the type of foot complications seen in diabetic population along with the other factors which may attribute to the foot complications. The study highlights the importance of foot care and relevance of early detection of diabetes and subsequent monitoring of the diabetic complications. With the rise in the prevalence of diabetes complications it becomes imperative to prevent foot problems at an early stage. Several prevention strategies including frequent foot examinations, appropriate patient education, and timely referrals, can help to ensure early diagnosis and treatment to prevent foot complications and lower extremity amputations. Targeting patients at increased risk for developing foot ulcer may be a cost effective strategy to control the progression to end stage complications. The study was conducted in the podiatry department so we could collect ample of patients with different types of foot complications. Majority of the patients were unaware of the foot complications and in many cases diabetes itself was diagnosed when the complication develops. Foot care was not proper, which may be the reason to develop complication even in the initial stages of diabetes. This type of studies will help to emphasize the significance of foot care especially in South India. Even though many studies on foot complications were conducted in other countries the pattern of such complications were not studied in detail in South Indian population. Since the study was conducted in a tertiary care center, the number of patients with diabetic foot complications approaching there may not depict the actual picture. The information could be much worth if it was a multicenter study with a longer duration. The antibiotic sensitivity pattern was also not studied, but empirically antibiotics were given. International Diabetes Federation. IDF Diabetes Atlas, 6 th ed. Brussels, Belgium: International Diabetes Federation; 2013. Bengalorkar GM, Kumar TN. Diabetic foot infections: A review. Int J Biol Med Res 2011;2:453-60. McEwen LN, Ylitalo KR, Herman WH, Wrobel JS. Prevalence and risk factors for diabetes-related foot complications in Translating Research into Action for Diabetes (TRIAD). J Diabetes Complications 2013;27:588-92. Pendsey SP. Epidemiological aspects of diabetic foot. Int J Diabetes 1994;14:37-8. Smith SR, Reed JF 3 rd . Prevalence of mixed infections in the diabetic pedal wound: A perspective based on a national audit. Int J Low Extrem Wounds 2002;1:125-8. UKPDS 33. Intensive blood glucose control with sulphonylurea or insulin compared with conventional treatment and rise of complications in type 2 diabetes. Lancet 1998;352:837-53. New JP, McDowell D, Burns E, Young RJ. Problem of amputations in patients with newly diagnosed diabetes mellitus. Diabet Med 1998;15:760-4. 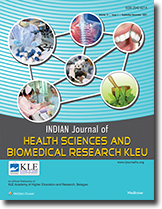 Gadepalli R, Dhawan B, Sreenivas V, Kapil A, Ammini AC, Chaudhry R. A clinico-microbiological study of diabetic foot ulcers in an Indian tertiary care hospital. Diabetes Care 2006;29:1727-32. Raja NS. Microbiology of diabetic foot infections in a teaching hospital in Malaysia: A retrospective study of 194 cases. J Microbiol Immunol Infect 2007;40:39-44. Mayfield JA, Reiber GE, Nelson RG, Greene T. A foot risk classification system to predict diabetic amputation in Pima Indians. Diabetes Care 1996;19:704-9. Al-Maskari F, El-Sadig M. Prevalence of risk factors for diabetic foot complications. BMC Fam Pract 2007;8:59. Asha K, Aprana S, Aravind J. Microbiological profile of diabetic foot ulcer. Calicut Med J 2011;9:e2. Haffner SM, Lento S, Laakso MN. Mortality from coronary heart disease in subjects with type 2 diabetes and in nondiabetic subjects with and without prior myocardial infarction. N Engl J Med 1998;330:229. Hunt JA. Foot infections in diabetes are rarely due to a single microorganism. Diabet Med 1992;9:749-52. Viswanathan V, Jasmine JJ, Snehalatha C, Ramachandran A. Prevalence of pathogens in diabetic foot infection in South Indian type 2 diabetic patients. J Assoc Physicians India 2002;50:1013-6. Anandi C, Alaguraja D, Natarajan V, Ramanathan M, Subramaniam CS, Thulasiram M, et al. Bacteriology of diabetic foot lesions. Indian J Med Microbiol 2004;22:175-8. Candel González FJ, Alramadan M, Matesanz M, Diaz A, González-Romo F, Candel I, et al. Infections in diabetic foot ulcers. Eur J Intern Med 2003;14:341-3. Martínez-Gómez Dde A, Ramírez-Almagro C, Campillo-Soto A, Morales-Cuenca G, Pagán-Ortiz J, Aguayo-Albasini JL. Diabetic foot infections. Prevalence and antibiotic sensitivity of the causative microorganisms. Enferm Infecc Microbiol Clin 2009;27:317-21. Yoga R, Khairul A, Sunita K, Suresh C. Bacteriology of diabetic foot lesions. Med J Malaysia 2006;61 Suppl A: 14-6. Shankar EM, Mohan V, Premalatha G, Srinivasan RS, Usha AR. Bacterial etiology of diabetic foot infections in South India. Eur J Intern Med 2005;16:567-70. Citron DM, Goldstein EJ, Merriam CV, Lipsky BA, Abramson MA. Bacteriology of moderate-to-severe diabetic foot infections and in vitro activity of antimicrobial agents. J Clin Microbiol 2007;45:2819-28. Lipsky BA, Berendt AR, Deery HG, Embil JM, Joseph WS, Karchmer AW, et al. Diagnosis and treatment of diabetic foot infections. Clin Infect Dis 2004;39:885-910. El-Tahawy AT. Bacteriology of diabetic foot. Saudi Med J 2000;21:344-7. Zeillemaker AM, Veldkamp KE, van Kraaij MG, Hoekstra JB, Hoynck van Papendrecht AA, Diepersloot RJ. Piperacillin/tazobactam therapy for diabetic foot infection. Foot Ankle Int 1998;19:169-72. Dang CN, Prasad YD, Boulton AJ, Jude EB. Methicillin-resistant Staphylococcus aureus in the diabetic foot clinic: A worsening problem. Diabet Med 2003;20:159-61. Goldstein EJ, Citron DM, Nesbit CA. Diabetic foot infections. Bacteriology and activity of 10 oral antimicrobial agents against bacteria isolated from consecutive cases. Diabetes Care 1996;19:638-41. Chang A, Eslao E, Panilagao G, Quimpo J. Diabetic foot ulcers: Experience at the Philippine general hospital. Phil J Intern Med 1996;34:205-9.